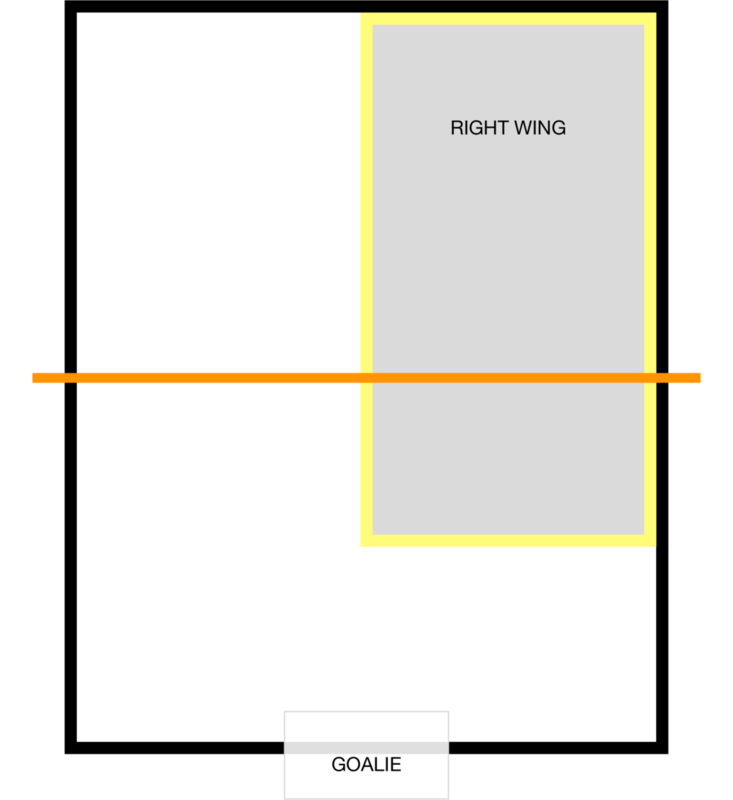 Right Wing coverage area shown above. For at least one practice, reserve an entire 7v7 field. Prior to the practice, choose a field strategy that will complement the strengths of your team. Coverage areas for every position are delineated on the field strategy diagrams. Hint: prior to beginning this exercise, let the kids scrimmage to burn off some energy. Use cones to outline every overlapping coverage area on the field. You may need up to twenty minutes (prior to practice) to strategically place the cones. Put at least one player into every coverage area. With the ball in your hands, quickly move around the field while asking every player on the field to rapidly move to the best place within his or her coverage area to be. Example: If you are in the far right corner of the attacking end of the field, every player should have moved to a place within their area of responsibility that is as close to you as possible. The Right Wing should be standing next to you. This is a great time to stress ABM (Always Be Moving) to the best place in your coverage area to receive or to intercept a pass...no matter where the ball is on the field. Review, correct, and repeat until everyone understands where to be in each coverage area...no matter where the ball is on the field. With the coverage area cones still on the field, and at your water break, using a dry erase board, relate the board to the field size, to your selected field strategy (drawn on the board), and to every overlapping coverage area on the field. If you do this while the cones are on the field, coaching with a dry erase board during games will be far more effective. With the coverage area cones still on the field, restart the scrimmage. Place yourself within the scrimmage and repeatedly communicate your on-field expectations (e.g. : Always Be Moving). Pertaining to this exercise [coverage areas] use the flashcards listed below [as reminders] to set your on-field expectations. ABM - Always Be Moving. Every player needs to understand that even if he or she does not possess the ball, he or she must Always Be Moving [ABM] to the best place to receive or to intercept a pass (within their coverage area). CES - Create Elephant Space. “When we go on attack, instantly create and maintain elephant space between you and the closest defender.” Elephant spaces are big enough for...an elephant to walk through. DNL - Defend Never Land. “If the ball is in Neverland, alarm bells should be going off! Instantly move into or toward Neverland! Everyone works together to drive the ball out of neverland! Defend Never Land as if invaders are coming to [use your imagination].” The younger kids love the concept of defending Neverland! CYA - Cover Your Attackers. When the other team has possession, no matter where the ball is on the field, cover the attackers that are in your coverage area. Play Your Position (PYP), Cover Your Attackers (CYA), and get ready to intercept a pass. Select other flashcards to use as coaching reminders during this exercise.